In a game dominated by the sending off of Atlético Madrid's Vrsaljko in the 10' minute, Atlético survived and put on a masterclass in concentration and defending. Many would say that Arsenal missed a great opportunity but once the second half began at 0-0 Atlético had time to recover and refocus and the 2nd half was very measured and disciplined. Deep service from Jack Wilshere looking for Welbeck behind the defense. Again, 1v2 in the box and the ball was cleared away. Arsenal Attempted 34 crosses in the game at 35% success rate (InStat). Arsenal needed to get behind the backline of Atlético Madrid but that did not happen very often, most of the time they were forced to play crosses from wide spaces deeper than are often effective, especially against defensive specialist like Godin and Oblak. When Arsenal did have players in the box to create chances off of the crosses they unfortunately missed the on the quality of the cross. This was cleared at the near post by Godin. Lacazette gets behind the backline of the defense and forces them to face their own goal. Notice the body shape of #2 Godin and #24 Gimenez. This cross was driven between the goal keeper and the backline but Welbeck was unable to get a touch on the ball. When Arsenal did get behind the defense to create crossing chance they did score a goal from a wonderful ball by Jack Wilshere which was clipped to the back post and finished by Alexandre Lacazette. 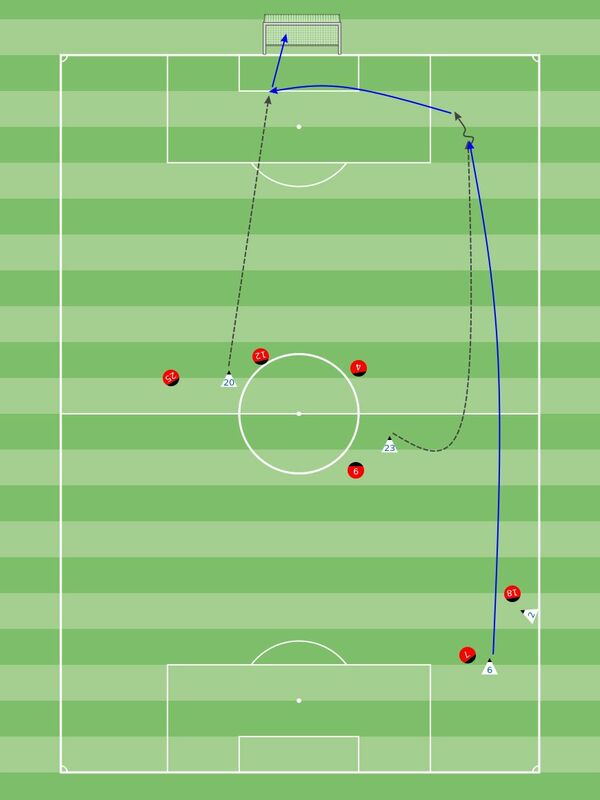 These types of runs and crosses from behind the back line really put the defense in a tricky situation because of the body shape. In the examples above you can see that the body shape of the defenders is sideways on but still facing slightly forward, away from the goal. In the examples below, when Arsenal get behind the backline the defense is now facing their own goal, which is a much more uncomfortable and difficult situation to clear a ball. Goal by Lacazette. Notice the body shape of the #2 Godin and #19 Hernandez, facing their own goal. When defenders are put in this type of situation it is very difficult to get a good jump on the ball and you must flick it away which ends in a poor clearance. Ramsey denied by Oblak right hand save. In conclusion, Atlético Madrid did a very good job of denying the spaces behind them and forced Arsenal to play side to sided without much penetration. When Arsenal did create real quality chances either the quality of the service was just off or the finish was just off, or in the case of the Aaron Ramsey chance below just good goal keeping. In the return match Arsenal will need more penetration to create quality chances and move on into the Final. Welcome to The Tactics Corner where Coach Bradley Morrison walks you through his analysis of the Carabao Cup semifinal between Arsenal and Chelsea, a match that ended in a 2-1 victory for the Gunners. If you liked the video, please consider subscribing as well as leaving any suggestions for future Tactics Corner episodes!